On a wall in a conference room in the shadow of the state Capitol hangs a painting that freezes the pivotal moment of the Texas victory over Notre Dame in the Cotton Bowl that sewed up the 1969 national championship. Senior quarterback James Street is on the sidelines talking to Coach Darrell Royal under a scoreboard showing that it’s fourth-and-two on the Notre Dame 10-yard line with just over two minutes to go and Texas trailing 17-14. The quarterback known for clutch play and the folksy coach who always played for the win could not have looked calmer. After all, this situation was nothing compared with the heart-stopping fourth-and-three call in the fourth quarter at Arkansas a few weeks earlier. In that Game of the Century, as the contest between the top two undefeated teams was hyped, the power-running Horns uncharacteristically called a long pass to tight end Randy Peschel and went on to win 15-14 with President Nixon in the stands in Fayetteville and a spellbound nation watching on TV. That perfectly thrown pass cemented Street as a Longhorn legend, but the Notre Dame game would seal his legacy. Street’s hustle and toughness have also paid off in his business career and are qualities passed down to his sons, including 22-year-old Huston, a star relief pitcher for the Oakland A’s who was named the 2005 American League Rookie of the Year. Sitting in the memorabilia-filled offices of the James Street Group, the ex-quarterback says the painting tells only a part of the story. “Luck is what happens when preparation meets opportunity,” he says, reciting his favorite Royal quote. “We got a lot of good bounces, and the defense came through when it had to.” Now 57, Street is head of a company that specializes in “structured settlements,” giving long-term financial advice to plaintiffs who’ve recently settled wrongful death or personal injury lawsuits. He’ll talk football — twist his arm and he’ll tell you about “The Play,” as the pass to Peschel has been tagged in Longhorn lore — but family and business come first. “I didn’t want to be one of those guys sitting on a bar stool and talking about the glory days and then realizing, one day, that it was 35 years ago and I was still telling the same stories,” he says. If Vince Young wakes up Thursday as the quarterback who led Texas to a national title, the only man in Austin who can truly identify is Street, who won 20 straight games in almost two full seasons as UT’s starter. But where Wednesday’s Rose Bowl game against the University of Southern California is an important steppingstone for a quarterback seemingly headed for an illustrious pro football campaign, the Jan. 1, 1970, Cotton Bowl marked the end of Street’s football career. He was the prototype wishbone quarterback, a sleight of handoff wizard nicknamed “Slick,” but they didn’t use the wishbone in the NFL. Also a standout pitcher at UT, with a perfect game against Texas Tech in 1970, Street figured his best chance at pro ball was on the mound. But when that career also didn’t pan out, he spent a year capitalizing on his Longhorn exploits by singing country standards, Elvis covers and “Raindrops Keep Falling On My Head” in Steiner rodeos all over Texas. He even hung out with Presley, who said he cheered for Texas against Arkansas, for a few hours one night in Las Vegas. Street’s first marriage, to Shanny Lott (the sister of Farrah Fawcett’s college boyfriend Greg Lott), ended in divorce after six years of marriage right out of college. Their only son, Ryan Street, 31, is an architect in town who’s designed Lance Armstrong’s homes in Dripping Springs and Spain and the new one in Tarrytown. Street married his second wife, Janie, who like him has a twin sister, in 1981. Huston was born two years later, followed two years after that by twins Jordon and Juston, both 20-year-old pitchers for the Longhorn baseball team. Westlake High senior Hanson rounds out the Streets. Friends say James Street’s relatively low profile through the years has less to do with an aversion to the limelight than being the father of five active, athletic sons. “If James is not working, he’s coaching kids or watching his sons play,” says Feller, who has remained close to Street, as have most members of the ’69 team. James Street says he’s also a bundle of nerves when he watches his sons in competition. “I’m a lot more nervous during their games than I was when I played,” he says with a laugh. Game of the Century Teammates certainly witnessed no jitters when Street came back in the huddle during that 1969 Arkansas game and relayed the call from Royal on fourth-and-three with 4:47 left and Texas down 14-8. “You’re not going to believe this play, but it’s gonna work,” Street said to the other 10 players, each bearing a reflection of Street’s steely gaze. “It’s gonna work,” he repeated, and then he called the famous right 53 veer pass to tight end Peschel. Almost everyone in the audience was sure the Horns, with the full house backfield of Steve Worster, Jim Bertelsen and Ted Koy, would run for the first down. “Now I’m lookin’ at you, Cotton,” Street said to Speyrer in the huddle, “but I’m talking to you, Randy,” he said to Peschel, trying to throw off any Razorback spies. “If you get behind ’em, run like hell.” Peschel was covered by a pair of fast-closing defensive backs, but Street laid the ball in perfectly, over the tight end’s shoulder and into his hands. The gamble paid off, going for 44 yards to the Arkansas 13; Bertelsen ran it in from the two for a TD a couple of plays later. The Game of the Century lived up to its billing, with Texas coming back from a 14-0 deficit in the fourth quarter to win 15-14. Besides having the undefeated No. 1 team face off against the undefeated No. 2 team, in the 100th anniversary of college football, the Texas-Arkansas game gained importance because it came in the midst of so much cultural upheaval. 1969 was the year of Manson, moonwalks, Chappaquiddick, Woodstock, “Midnight Cowboy” and Vietnam. Especially Vietnam. The game took place the same day a young concertgoer was stabbed to death by Hell’s Angels at a free Rolling Stones concert at Altamont Speedway in California. In 1969, America was very much a polarized nation. “I think a lot of people wanted to watch a football game to get their minds off the other stuff,” Street says. But in the Horns’ jubilant locker room after the game, when Nixon declared Texas the national champion, the timbre of the times became evident when a Horn player thanked Nixon. When Nixon said the thanks belonged to the players for such an incredible game, the Horn shot back, “I’m thanking you because my lottery number was 350!” The government had implemented a military draft lottery to shore up troops in Vietnam just six days earlier. At Robert Mueller Municipal Airport the night of the big win, about 20,000 fans greeted the team, toppling barricades and running out to the taxiing plane as though it carried the Beatles. Fans clawed at Street’s hair and clothes until he asked one of his burly linemen to run a little interference: “Just give me an opening, and I’m gone,” and he was. All Street ever needed was a little daylight. James Street 2005. Photo by Jay Janner for AAS. Street never misses a home game, nor the Red River Shootout, so long as one of his boys doesn’t have a game the same day. What impresses him most about Vince Young, he says, is the way the people in the stands seem to exhale when No. 10 trots out on the field. “He just instills so much confidence. There’s no panic in that guy.” The same could be said for the man who wore No. 16 from ’67 to ’69. 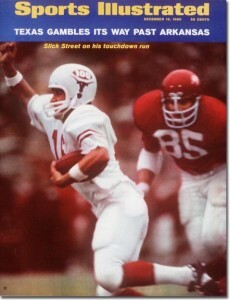 Last year, the 1969 Arkansas team invited its legendary adversaries up to Fayetteville for a 35th anniversary reunion, a players-only event Street calls “probably the neatest experience I’ve had as an ex-player.” Street counts Arkansas quarterback Bill Montgomery, now a successful businessman in Dallas, among his closest friends. Players gave testimonials about how The Game changed their lives. Several choked back tears. Street started thinking about what was his favorite memory of the game that will forever define him to many. “I remembered just being spent — emotionally, physically — as I walked off the field, but also completely re-energized because we won,” Street says. “And in the middle of all that pandemonium, I saw (Arkansas Coach) Frank Broyles’ kids run over to him and hug him. He had just lost the biggest game of the year, giving up a 14-point lead, no less, and yet his family was there to support him. It didn’t mean much to me at the time, but that’s what I was thinking about” at the reunion. James Street passed away Monday Sept 30, 2013. This entry was posted on September 4, 2016 at 7:47 pm	and is filed under Uncategorized. You can follow any responses to this entry through the RSS 2.0 feed. You can leave a response, or trackback from your own site.